Announcement Welcome to Reinstated Designs etsy store! Thanks for taking the time to check out my upcycled creations! Reinstated Designs is eco, slow fashion at it's finest! 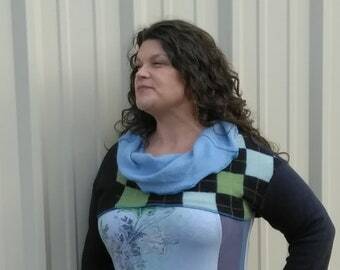 I design and sew my creations in a sweet, little studio in Ashland, Oregon. I take pride in maintaining solid roots to my local community and to our Mother Earth while creating a conscious role model for small businesses. Many thanks to my loyal customers and to all of you who take the time to browse my pages! Some of you have known me through the years (15 to be exact!!) as Hempress Arise. 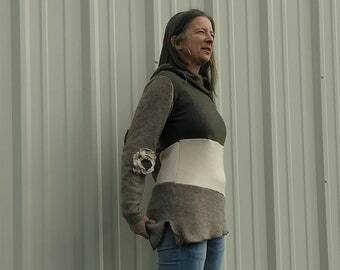 I am still creating hemp clothing (www.hempress.etsy.com), but I have found true passion in taking discarded garments and turning them into one-of-a-kind works of wearable art! Keep an eye out for new listings or feel free to contact me if you have a special request! Thanks for your time and for your support! Welcome to Reinstated Designs etsy store! Thanks for taking the time to check out my upcycled creations! Reinstated Designs is eco, slow fashion at it's finest! I design and sew my creations in a sweet, little studio in Ashland, Oregon. I take pride in maintaining solid roots to my local community and to our Mother Earth while creating a conscious role model for small businesses. Many thanks to my loyal customers and to all of you who take the time to browse my pages! Upcycled Side Zip Hooded Sweatshirt! Meow!! Find Reinstated Designs At Markets and Festivals! 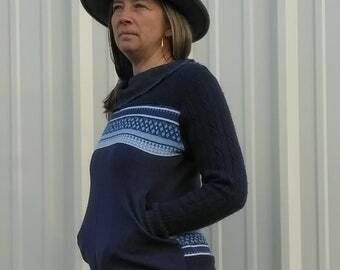 Upcycled Wool Sweater With Pockets! Super Sassy Peacock Feather Tank! Heidi has been creating fiber art since she was a young girl. 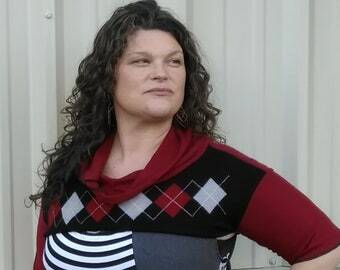 Starting with doll clothes, pillows and eventually diving into the fashion world she found a passion that would eventually pave the way for Reinstated Designs. She traveled across the country stopping at large concert venues selling her patchwork creations out of the back of her Volkswagen Bus. After "settling down" and giving birth to two amazingly beautiful boys, she was able to slowly and intentionally focus her energy on new designs and sustainable fibers. Always wanting to be a mirror to shine forth the brightest light, Heidi wanted to create sustainable, wearable fashions from the highest quality fabrics......and so she did. 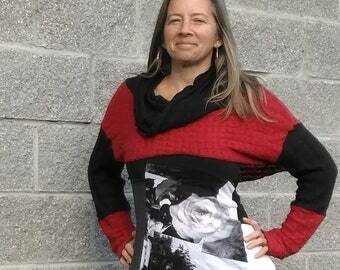 Reinstated Designs is a small, hand-crafted, upcycled clothing business. All garmets are created in Southern Oregon from 100% post consumer fabrics and/or natural fabric scraps (wool, hemp, organic cotton and bamboo) . The fun starts by digging through bins of clothing, gleaning inspiration form fibers that would soon find their way to the landfill. After all items are washed and sanitized, I completely dissect each piece of clothing (shirts, dresses, pants, sweaters, etc) and create fresh, new fabric. I have been owned and operated Hempress Arise since 2002, so designs are plenty! No need to invent the wheel! 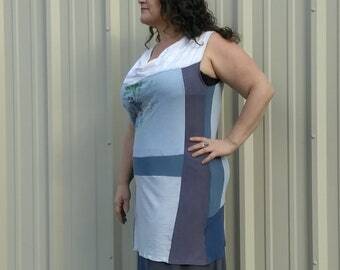 My designs are comfortable, sophisticated, upcycled creations meant to spark your joy for fashion ! Reinstated Designs maintains solid roots to community and to our Mother Earth while creating a conscious role model for small businesses. By Purchasing products from Reinstated Designs, you are not only supporting a small, family grown business, you are helping our local community to thrive. Thank you so much for taking the time to check out my on line store! I truly hope you enjoy my creations as much as I enjoy bringing them to you! Hi there! My name is Heidi! I'm a mom of two teenage boys, a partner to a wonderful man and a designer by passion!! 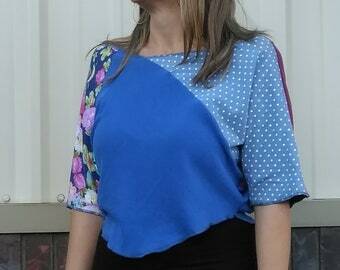 I just want you to know how much fun I have while creating upcycled clothing! Thanks for being a part of my journey!